EEEP, have I shown you the op shop goodies I found a couple of weeks ago? I like this floppy hat. 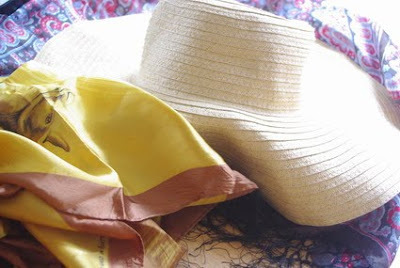 Usually I shy away from floppy hats. I have an image of sitting all glam and coy under my broad brim. The reality is a rather ungainly flapping of arms and legs to chase my hat down the beach every time a light wind lifts it off my lid. The scarf. Oh goodness, how many Australian souvenir scarves from the 1950s and 1960s does one girl need? The other was a gift for someone special. Went down a treat. And the pattern? 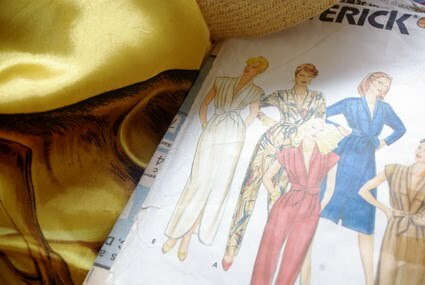 It will, no doubt, join this jumpsuit pattern. Yes, still unmade. Oh well. Great finds. I love the jumpsuit pattern... shame jumpsuits are just so difficult to wear, don't you think? There's a reason they come in and out of fashion (skinny jeans are right there with them). Love the scarf too - would love to see a post on your collection sometime. I shall hold on to my hat for the arrival of the jumpsuit. PS. LOVED your eye roll. hahaha i would've called those colours camel as well to be honest. read my next post. those pants/outfit was requested to be replaced.